Leave length at 1 meter to get L' and C' in per meter units. 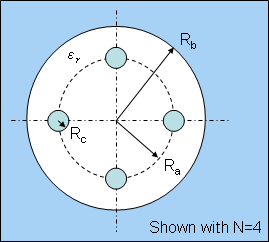 You can enter all radii as diameters instead, since ratios are taken. Tube diameter can be smaller that array diameter, Ra and Rb are switched in this case. 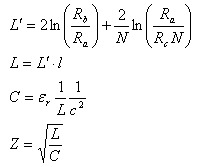 The first term in the equation for L' is exactly the impedance of coax with Ra and Rb. So, you can think of the second term as the addition inductance due to replacing one conductor with rods. Ron Boller who gives his original source as "Russel". 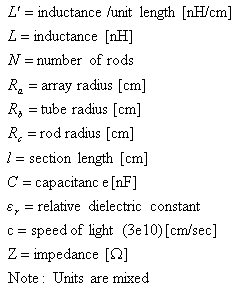 Capacitance is my own derivation.